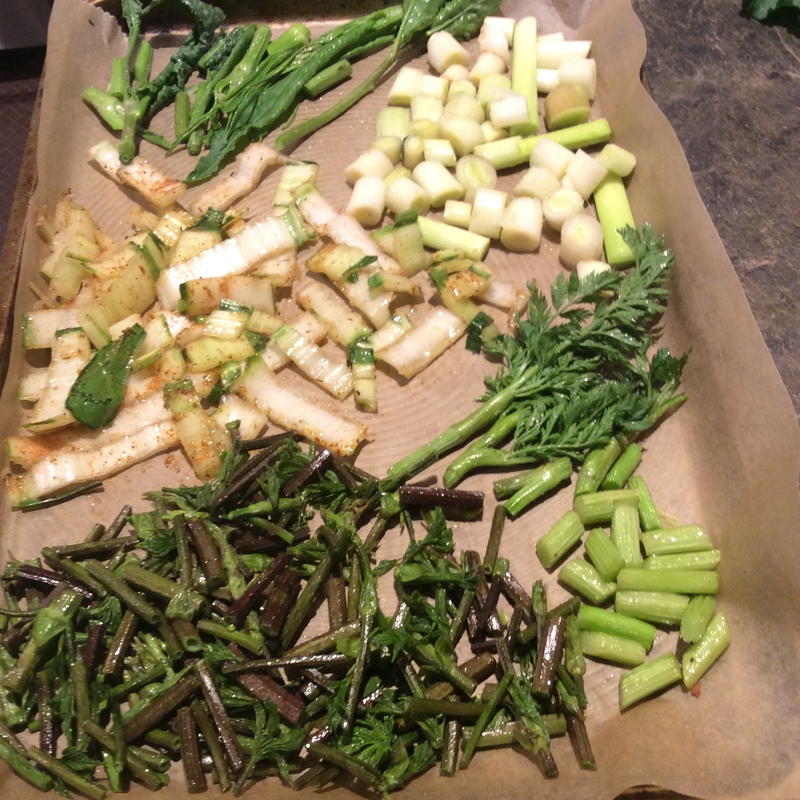 Last night I decided to try a grand assortment of the shoots found on or near my property right now. 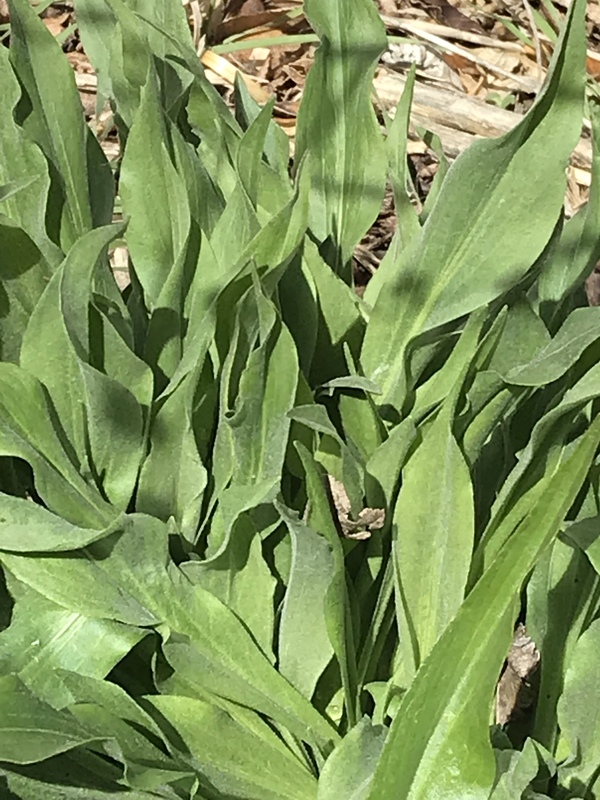 All would be oven-roasted in olive oil and salt at 500 degrees except for the garlic shoots, which are getting a bit tough this time of year as they elongate toward making scapes and need gentle stewing in olive oil over low heat for a long time, 25-30 minutes. They were cooked sparately on the stovetop. 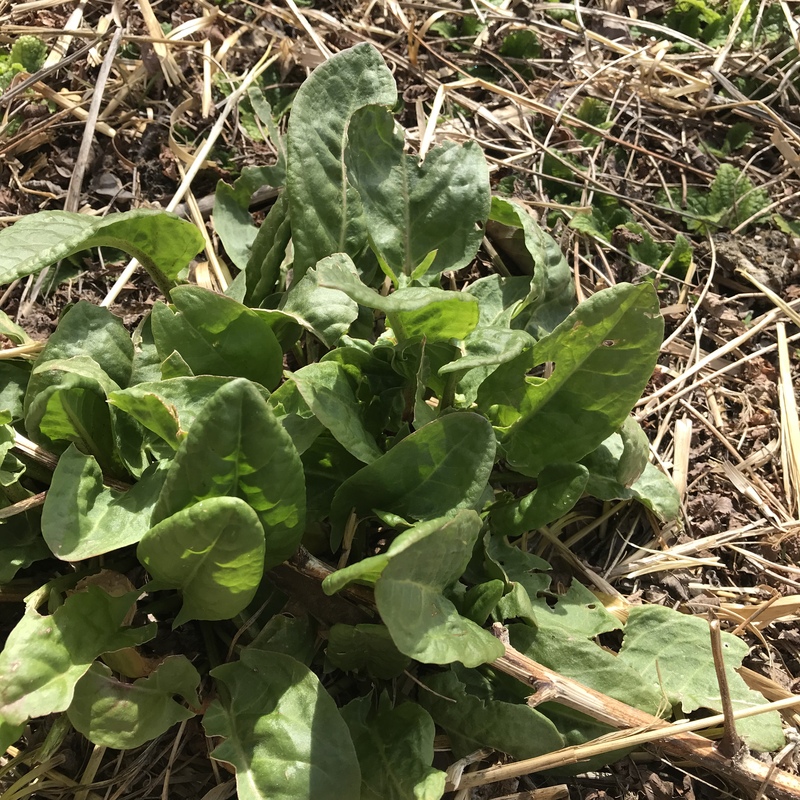 Annual arugula shoot with buds only just beginning to show. Dock shoots harvested before any flower buds show. Carrot shoots from some roots that I didn’t get around to harvesting. 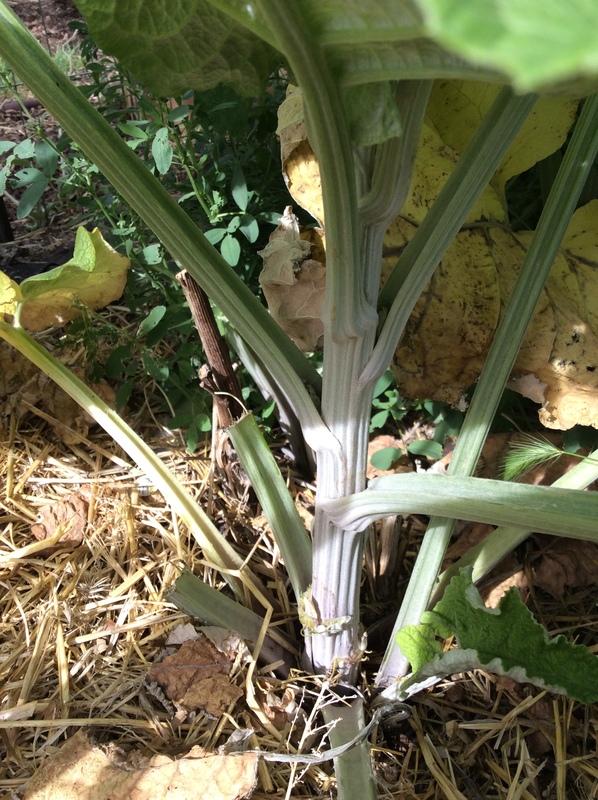 Stalk of a sunflower picked at about 18″ tall and the very fibrous outer layer carefully peeled off. They were tossed separately in olive oil and a little salt and kept in separate piles on the baking parchment so that we could discern the flavors accurately. 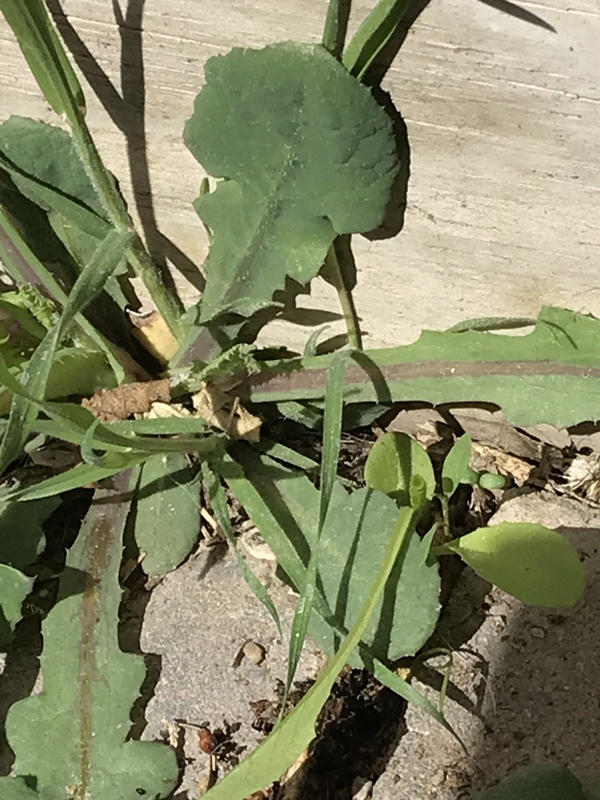 All but the arugula were cut in sections an inch long or less to mitigate possible stringiness. I added a couple of chard stems cut in 1/4″ cross sections, after I used the leaves for something else. Roast away in a preheated 500 degree oven, checking frequently and removing each at its preferred stage of doneness, i.e. when it looks roasted but not burned. I have been writing about green garlic all season, so no need to say anything more except that, as always, they were delicious. 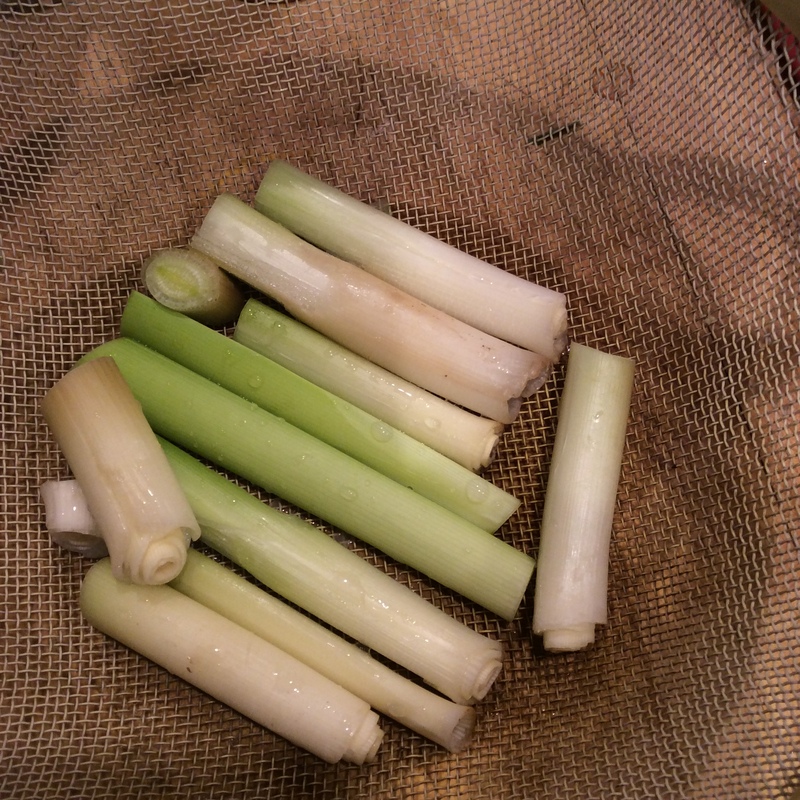 I love cattail shoots but my husband finds them only passable. Probably for solitary dinners in the future. 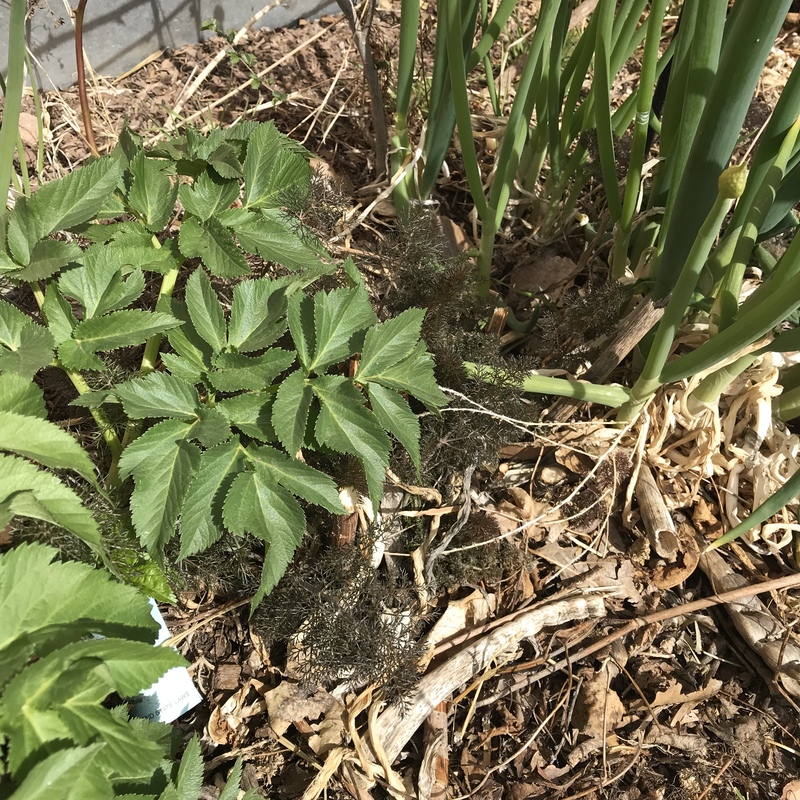 Love hops shoots with their feral, mildly bitter, “unimproved” flavor. Love them. Sunflower stalks have a pleasant enough, rather innocuous flavor and nice texture when carefully peeled. There are those on the Internet who claim that they just pluck them and eat them. These people have probably never been near a sunflower. More on this later. I have not yet found any way that I like chard stems except roasted and ground into a fairly good baba ghanoush. Eaten alone, there is a touch of dirt in the flavor that doesn’t do it for me. Dock shoots were amazingly good, with a soft center tasting of lemon with a strain of bitterness. 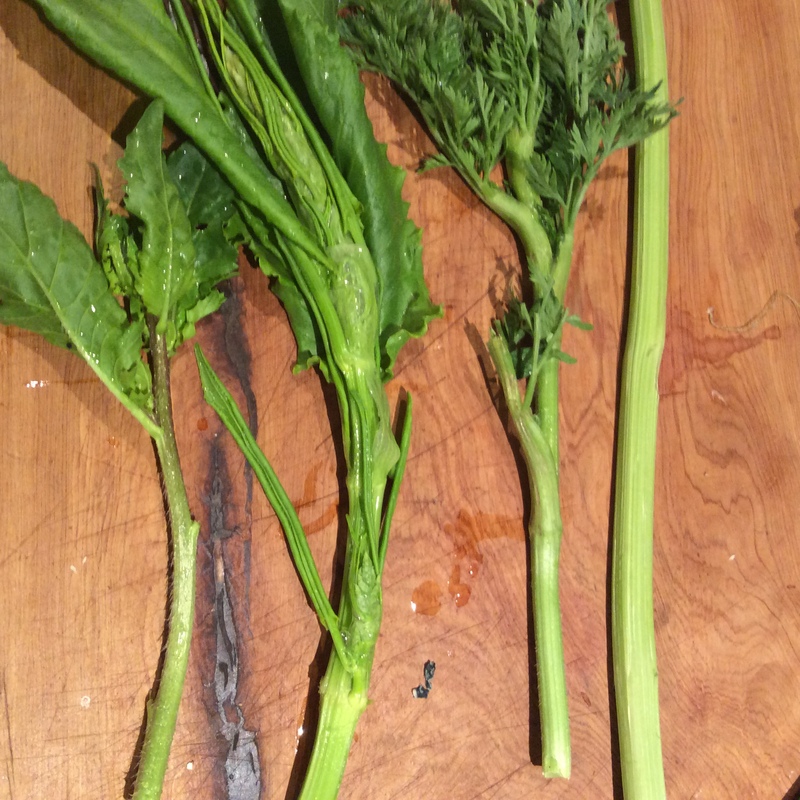 Be sure to cut into sections before cooking to eliminate the stringy factor, and pull large leaves off. Smaller ones can be left in place and are tasty. The arugula shoot was very slender but a bit stringy anyway. They, too, need to be cut into sections. Delicious though, although they are small and it would be tedious to pick enough for a meal. Carrot shoots were the real surprise. When roasted in sections they were tender, sweet, and full-flavored with a touch of the terpene scent that makes carrot foliage smell aromatic and carroty. 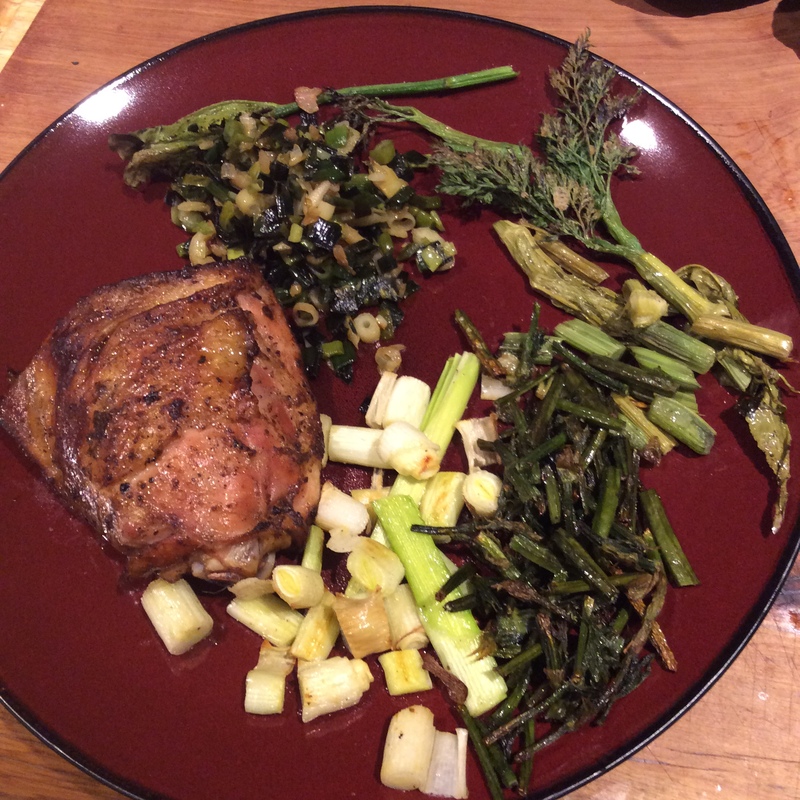 The remaining leaves got brown and crisp during roasting and added textural interest. 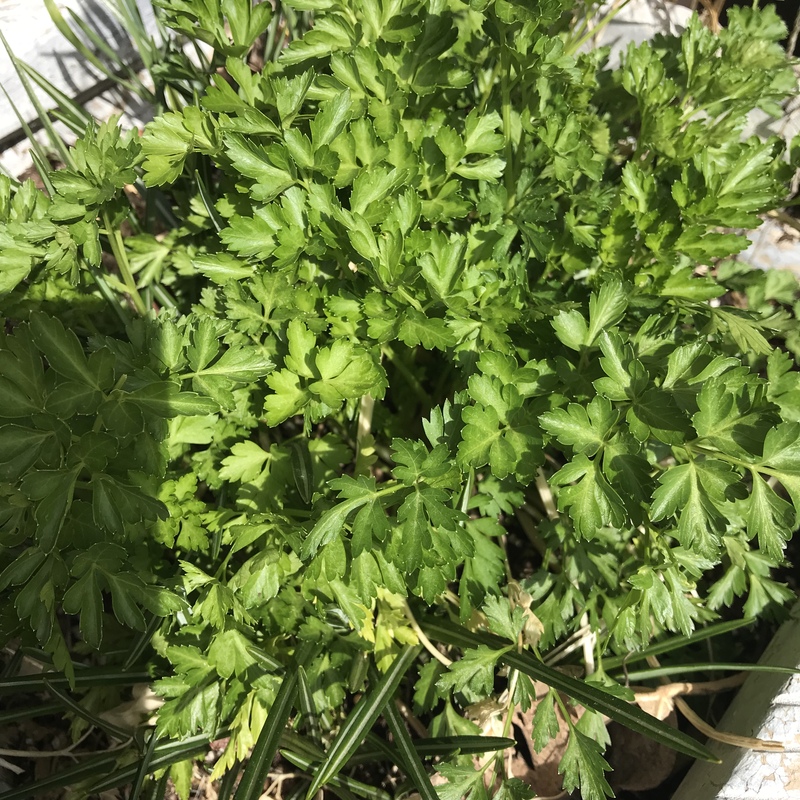 I liked them so much that I am going to leave the rest of the row of woody second-year carrots in place until they produce shoots. Even when the roots are at this advanced stage my goat loves them, so the roots will not be wasted. Initially I wanted to taste each type of shoot individually, but I will make a grand mixture in the near future by sorting sections roughly according to size, i.e. thin, medium, or thick. Then I’ll pan-fry them in olive oil in my biggest skillet, putting thick ones in first, then two minutes later mediums, followed by thin bits in another two minutes, then cook until done. Yum. Look around you and see what’s producing shoots right now. If (and only if) you’re certain that the foliage of that plant is edible, try them out in hot olive oil. 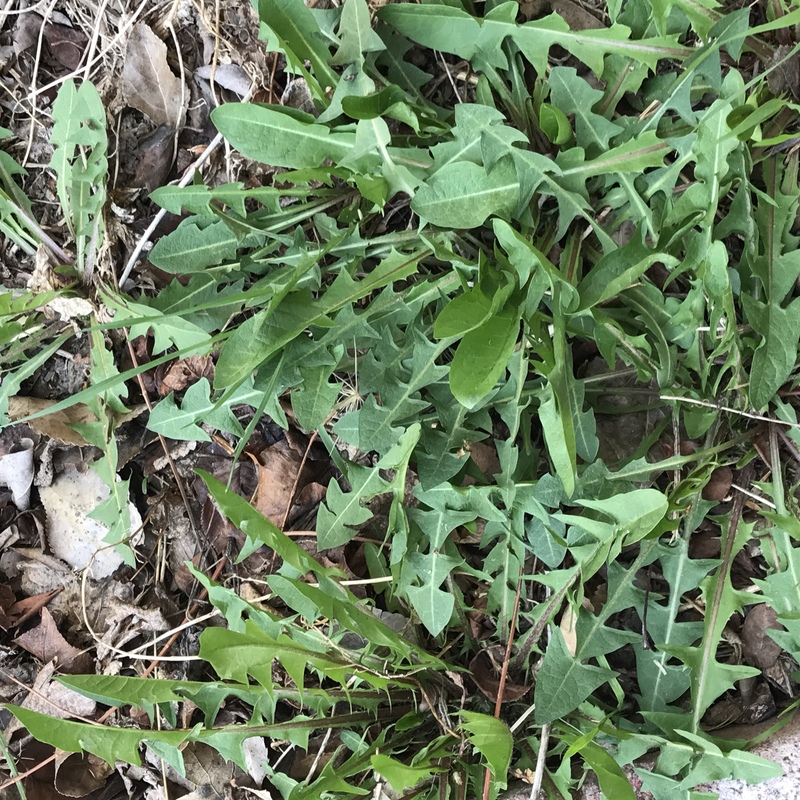 I enjoyed goji berry shoots a little earlier in the season, and will be trying wild lettuce and sow thistle within a week or two. 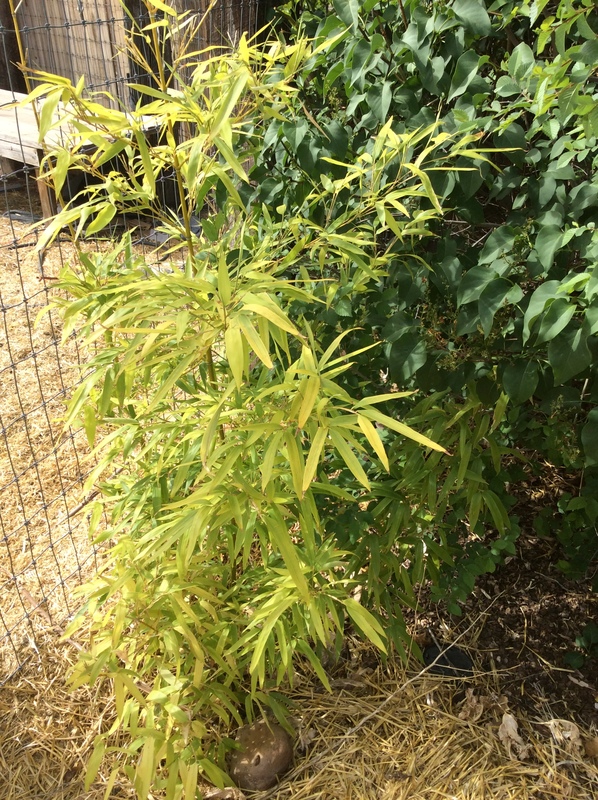 Some grapevines produce delicious shoots, although some ( most notably my Concord vine) have so much papery fiber in the leaves and shoots that I consider them inedible; read more here. Broccoli is widely touted for its nutritional content and culinary versatility, and my garden beds are full of broccoli-in-waiting, but there is also “broccoli” to be had right now. All the common garden crucifers produce bud clusters when they shoot to seed, and all of them are good to eat when snapped off before the flowers open. Some go to seed the first year, and some have to go through a winter before they bolt. 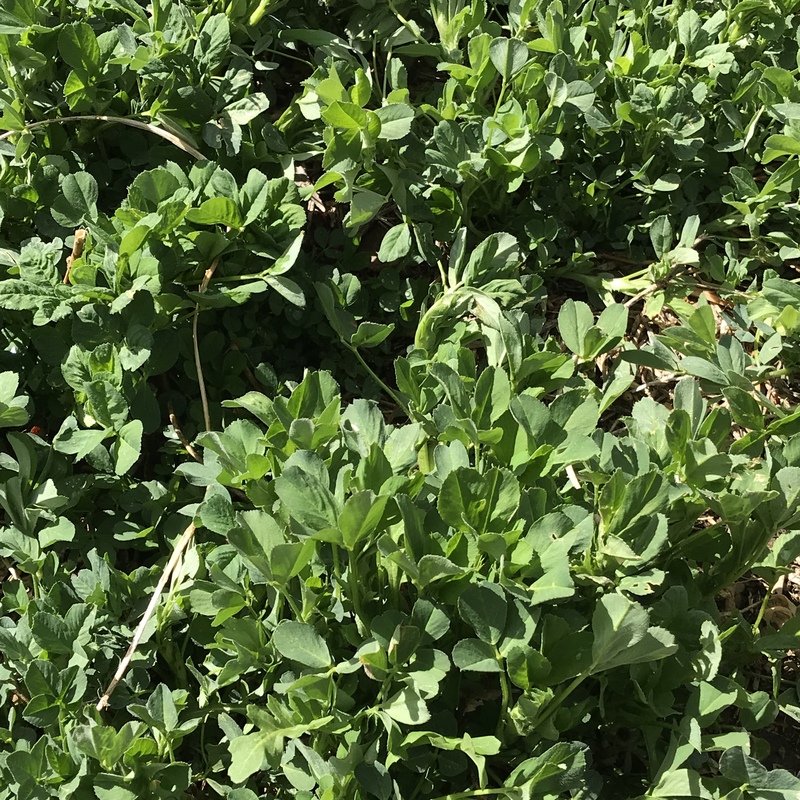 I try to use cover crops that will be edible as greens and also offer me a “second harvest” of bud clusters. 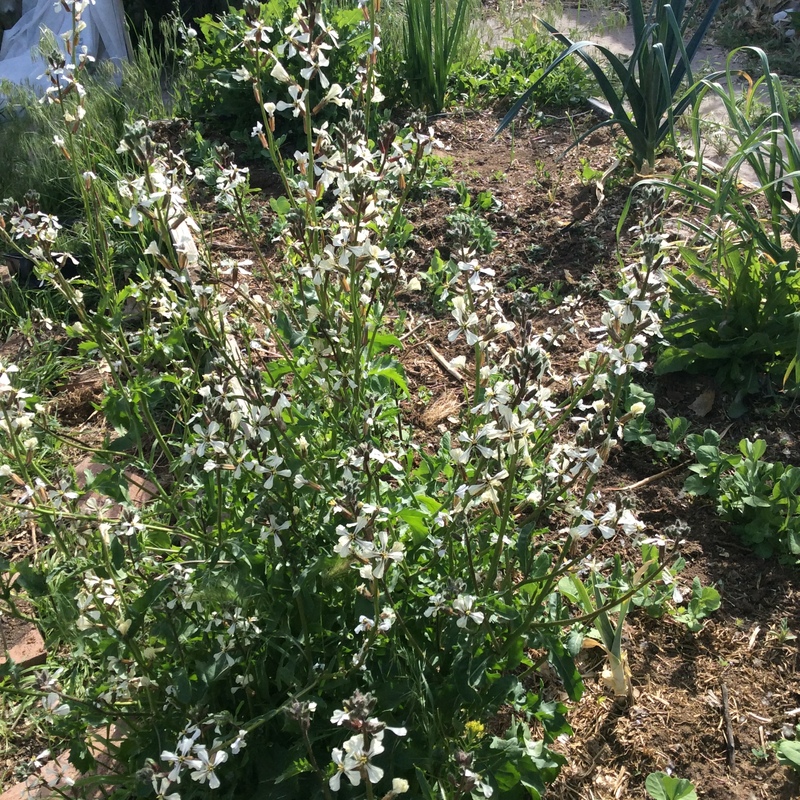 Currently I am harvesting bud clusters from arugula, daikon, and the collards that I over-wintered for seed production (they make a huge amount of buds, and a few clusters will never be missed). Arugula is especially good for this purpose, because first you get those exquisite nutty-peppery salad greens, second the top-bud harvest with its wild, unimproved, bitter-edged flavor, then the remaining buds open and are wildly attractive to bees, and finally the remainder of the plant enriches your soil when chopped and dug in, all in the span of a few months. I buy the seed in bulk and cover-crop it whenever a piece of garden bed is going to be empty for a little while. 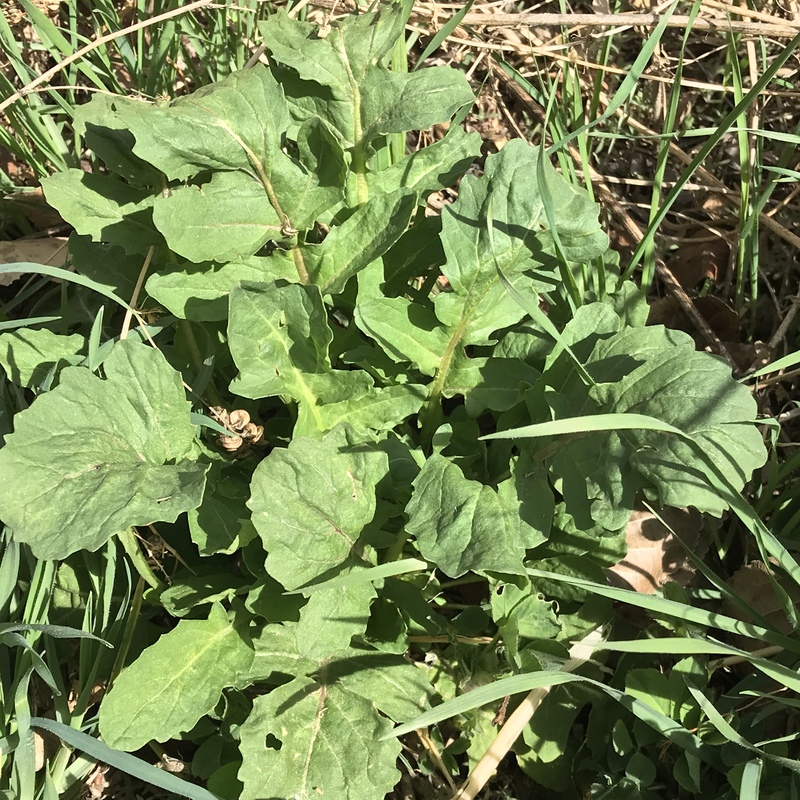 You can also harvest buds from bolted radishes and wintered-over kale, and probably a lot of things that I haven’t tried yet. Be aware that they are tiny, and you need a lot of plants to have enough to cook. 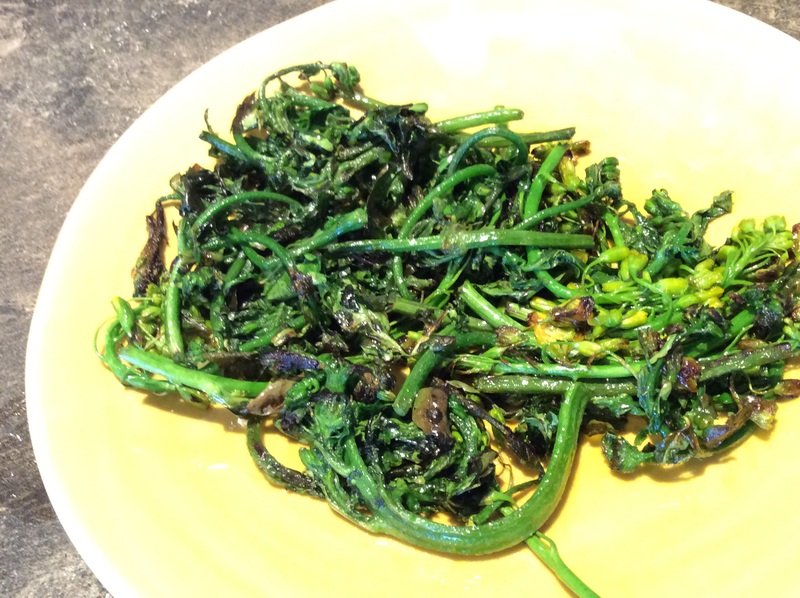 I have heard these offbeat buds referred to as “broccolini” or “brocoletta.” I call them brocolettas, because “broccolini” really refers to a form of domestic broccoli with long, small stems. When I call the flavor “unimproved,” I am referring to the fact that our common domestic vegetables are bred for the mildest flavor possible. The things that I grow and forage for are not. 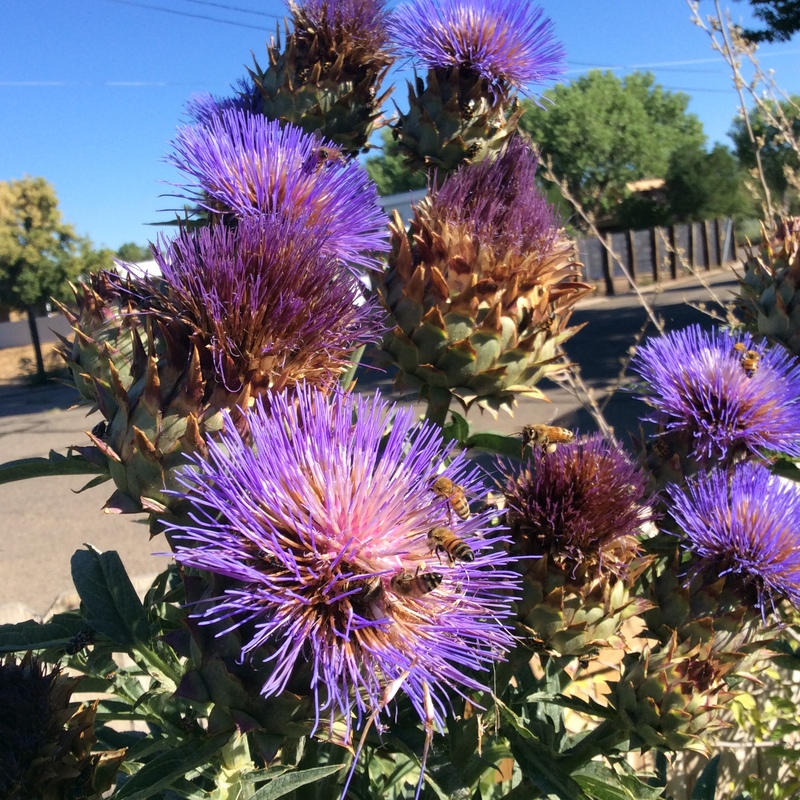 They have very pronounced flavors from their protective phytochemicals, and can stand assertive seasoning. Think garlic, red pepper, thyme, and other strong flavors. My favorite way of cooking the washed bud clusters is to throw them in a hot pan of very good olive oil with a little washing water still clinging to them, salt them, turn frequently and keep the heat fairly high, and serve them when the green parts are crisp-tender and there are crisp brown areas but no blackened spots, and eat them in their feral glory with some extra olive oil on top and a twist or two of the pepper-mill. They can be a “hot salad” on their own, or complement a flavorful entree. Take that, flavorless baby spinach! Nose-to-tail vegetable eating stretches over each vegetable’s growing season, in my view, rather than meaning that every single part of the vegetable is edible and choice. 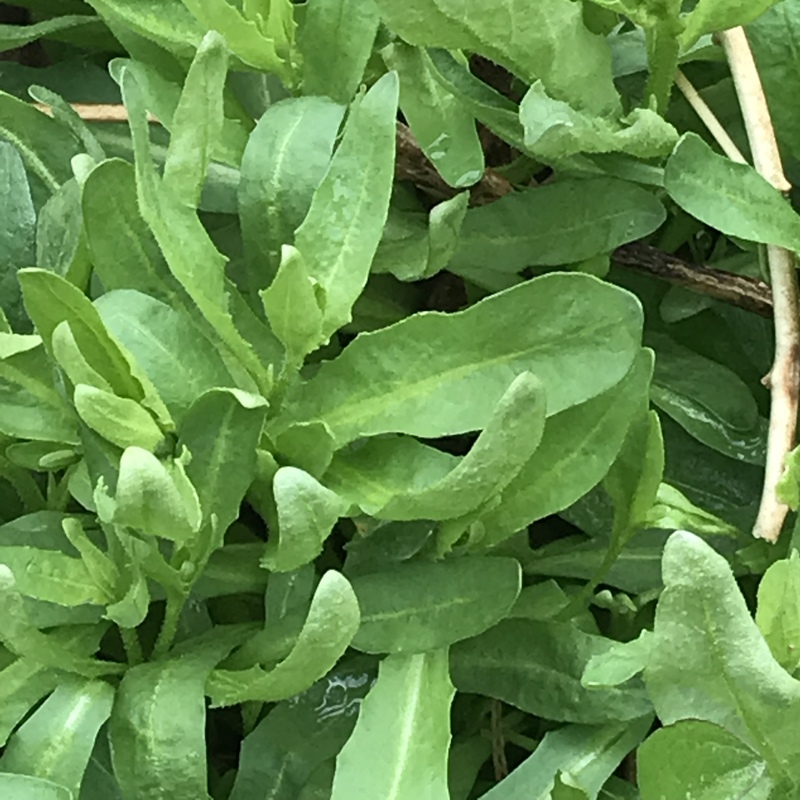 Arugula’s leaves and buds are very desirable eating, the flowers are excellent bee forage, and then the remaining plant offers biomass for mulch and compost, or you can let them self-seed first and have your next crop planted. Now that’s multi-purpose. Like the British cookbook writer Nigella Lawson, I am both greedy and lazy, so I’m full of timesaving tricks for making real food in a hurry. Now if I also looked like her, that would be nice, but two out of three isn’t bad. One of my favorite time-saving tricks is to make a small batch of yeast dough and stick it in the refrigerator with no clear idea what I’ll use it for. 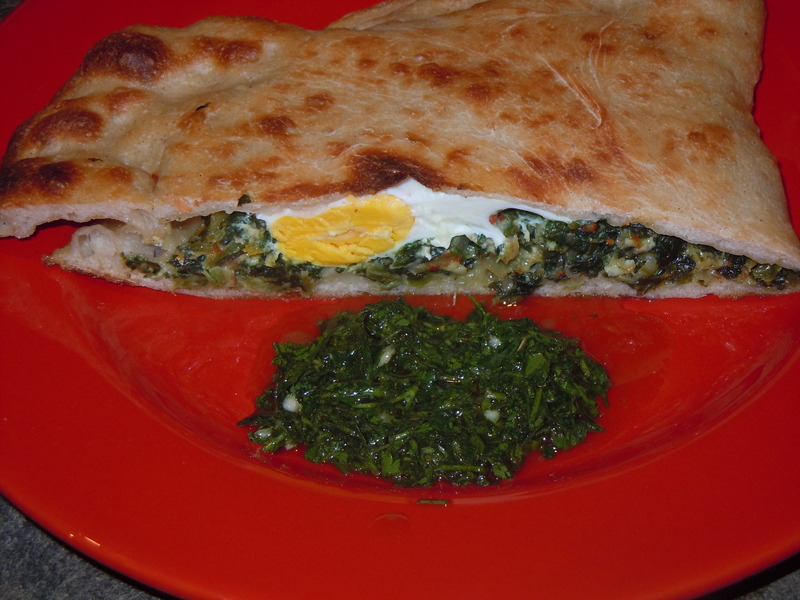 Most recently, I used it to make a variation on a hortapita, filled with mixed greens. Since my chickens have started to lay, I decided to incorporate eggs. This isn’t really a recipe. This is the sort of thing you throw together by instinct on days when you need the comfort of the kitchen but if you think too much more, your brain will break. If you don’t happen to keep dough hanging around, you can use ready-made pizza dough from the Co-op, but making your own is a cinch. My basic recipe is 2 cups water, 1 teaspoon sugar, 1/2 teaspoon dry yeast, and 2 teaspoons salt. Mix together, knead on a floured surface for five minutes, form into a ball, pop it into an oiled bowl and cover with plastic wrap, and set in the refrigerator for 1-2 days. On the second or third day, take the bowl out before you leave for work and leave it at room temp for the day. When you come home, it will be ready to use for a homemade pizza or hortapita. about a pound of mixed greens OR a pound of frozen organic spinach and a handful or two of stronger-flavored greens or herbs to give flavor. a packed cup of crumbled feta or shredded parmesan or some flavorful but not stinky cheese. Idiazabal, mild cheddar, or mild gouda would all be reasonable. I used Idiazabal because I usually have some around. 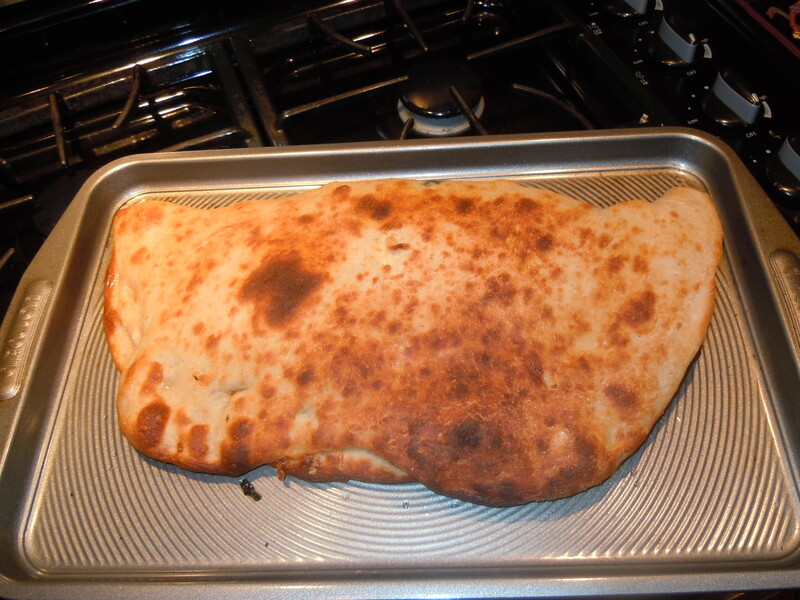 On a large baking sheet, smear around some olive oil and dump the dough on top. Pat it out with your hands, using vigorous stroking motions to spread it out into a big oval without tearing it. When it is about 1/4 inch thick and nearly as large as the pan, pile the greens mixture on half of it and make 3 or 4 depressions in the greens. Crack an egg into each depression, salt the eggs lightly, and fold the other half of the dough over the top and pinch the edges together. Smear a little more olive oil over the surface and stick in the hot oven until done, somewhere between 20 and 30 minutes. Eat with the knowledge that a tough day didn’t get you down. A glass of good strong red wine will help give you the wherewithal to face tomorrow. If you have just a little more energy and half a bunch of parsley, pound a clove of garlic, the parsley chopped, and the juice of half a lemon in your faithful big mortar and pestle. When somewhat pulverized, add enough of your best olive oil to make a chunky puree and salt to taste. I love this simple sauce/dressing/relish beside almost any vegetable or egg dish, but it’s especially good for bringing a makeshift hortapita to life. If you don’t have a big mortar and pestle yet, a food processor is okay. My eggs come out of my back yard now, and I give a fair amount of thought to feeding my chickens. If you want your eggs to be highly nutritious, you have to give the chickens the nutrients to make good eggs. For maximum security from predators my coop is fixed and nonmobile, so I cut grass and clover from the yard daily to supplement the laying mash. All the vegetable trimmings from garden and kitchen prep go to them, too. Any pumpkin or squash “innards” go to them so that they can eat the seeds. The chickens get oystershell for calcium, and they get any nutritious table scraps that would otherwise be wasted. For example, they will happily devour leftover salad, for which there is no other use, and rice or stale bread or bulgur are right up their alley. If I have leftover oatmeal or yogurt, they wolf it down. Now that we’ve had several frosts there aren’t many green things left in the yard, so I give the chickens some flaxseed every day to keep the omega-3 content of their eggs up (this is how the commercial high-omega 3 eggs are produced.) Flaxseed is expensive, so rather than give it to them dry and permit it to be scratched around and wasted, I mix it into yogurt or chopped vegetable scraps to make a slurry that they can eat out of a small dish. I also feed their own eggshells back to them for calcium, but I never just throw the shells into the coop, because this trains them to eat their own eggs (yes, healthy chickens with lots of room and food will eat their own eggs if they learn how, and once a flock has learned to eat eggs there’s no good way to stop them.) I set the shells on a plate and microwave them for one minute to dry them thoroughly, then let them cool and set them aside in a bag. When I’ve accumulated a dozen or so, I crumble them roughly by hand and then put them in the blender and grind them to a coarse powder. The powder is added to yogurt or leftover oatmeal and stirred in well. The chickens gobble it up and it helps them make strong eggshells. As part of our Christmas dinner, we had salads made entirely from our own yard produce. I had not used any season-extending devices at all, and we’d had cold weather and a few light snows, so these are the greens that thrive on cold and neglect. The “trim” is a ring of pansies, which I wrote about in an earlier post. The greens included arugula (see the post before this one,) pansy leaves (cool, tender, and delicious,) chervil, a few nasturtium leaves still surviving in a sheltered corner, my new favorite lettuce, and sunflower sprouts. The lettuce that I’ve enjoyed most this year is a gorgeous deep red romaine called “Marshall.” I think I got my seeds from Territorial. the color is a dramatic foil for almost anything else, and it doesn’r get bitter in our sudden hot springs. It’s beautiful in the garden, too. 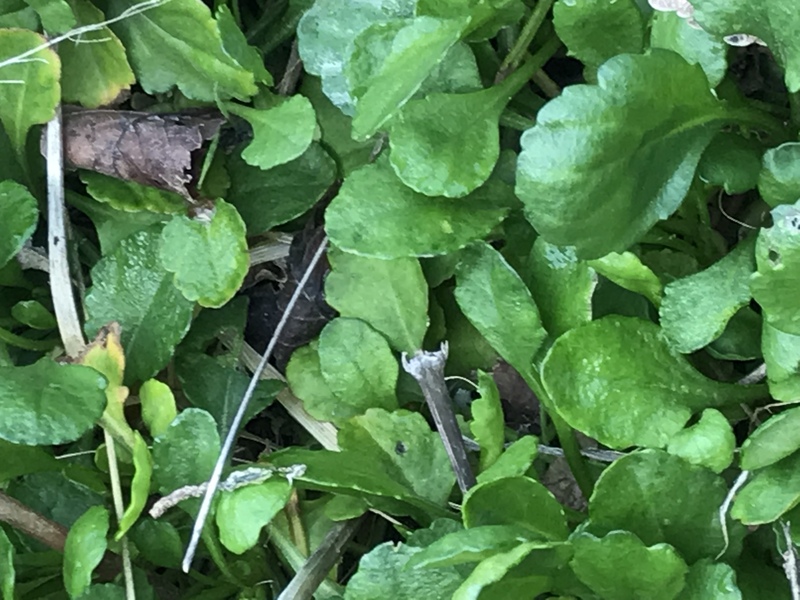 You can see it poking up through a light mulch in the photo below. The other photo shows my sunflower sprouts, and I wish I had known earlier how delicious they are. The first taste is pleasant and mild, but a delicious nuttiness rapidly reveals itself. These are the only sprouts that I’ve enjoyed eating out of hand, but they’re even better in a good mixed salad. Sunflower sprouts seem to be best when soil-grown, and they need a little light. I have a grow-light for my spring seedlings, and it usually goes unused in the winter, so I used it to grow the sprouts, but a sunny window would be fine. Start with a large flat container. I used a terra cotta saucer intended to hold a large potted plant, just because I had one sitting around. Put in an inch of good organic soil. Scatter raw organic sunflower seeds (in shell) very thickly on top, touching each other. Pat them into the surface, cover with another 1/4 inch or so of soil, water well but don’t make the soil soggy, and wait a few days. The books say to presoak the seeds, but I didn’t and they did fine. When they start to emerge, begin giving them light, and harvest when they are green and are trying to shed their shells. I snap them off at soil level with my thumbnail, flick off the clinging shell, rinse well and dry, and start snacking. 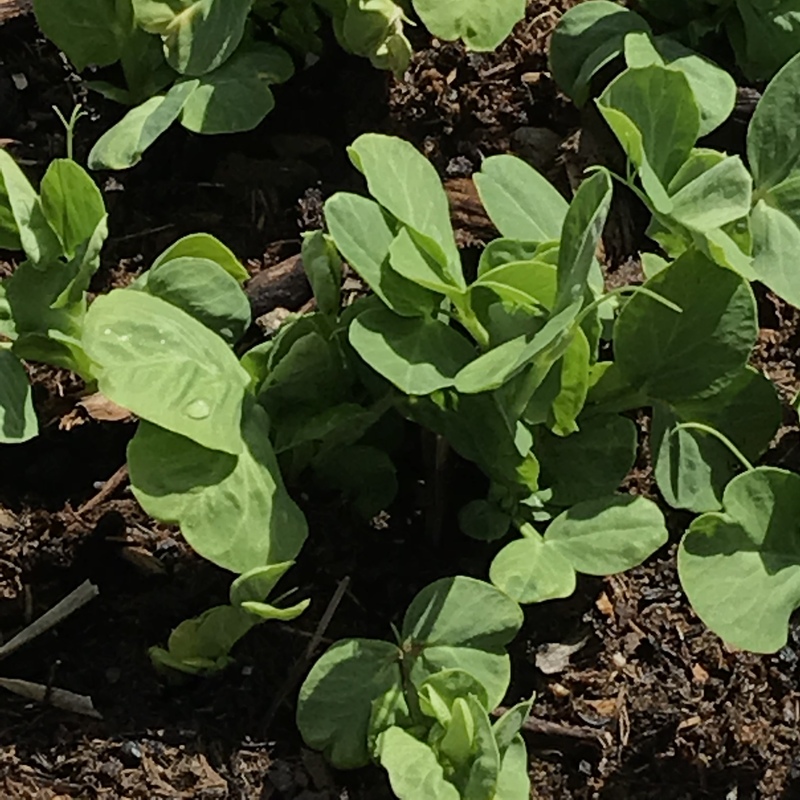 They go well with spicy mesclun mixes but can also give depth to a simple lettuce salad. Grow lots, so that you can use them lavishly. 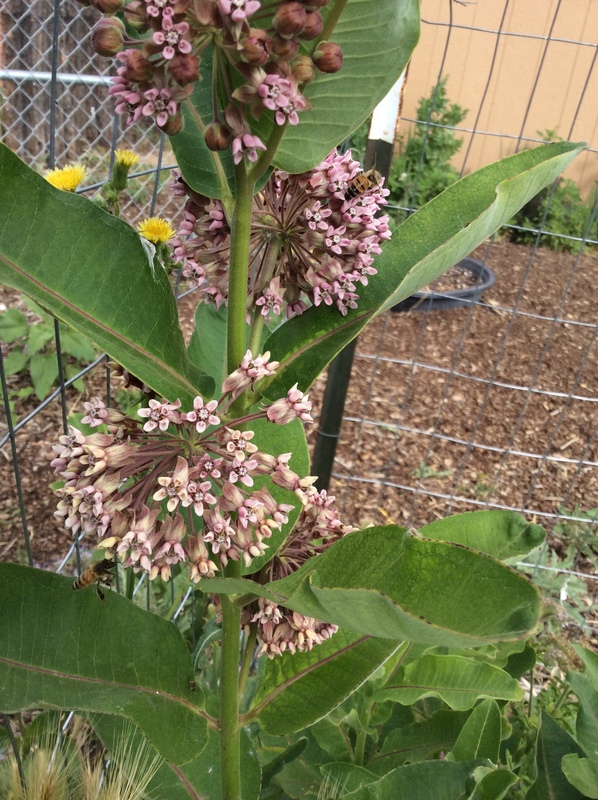 At times I’m very surprised by what grows well in my high desert garden. 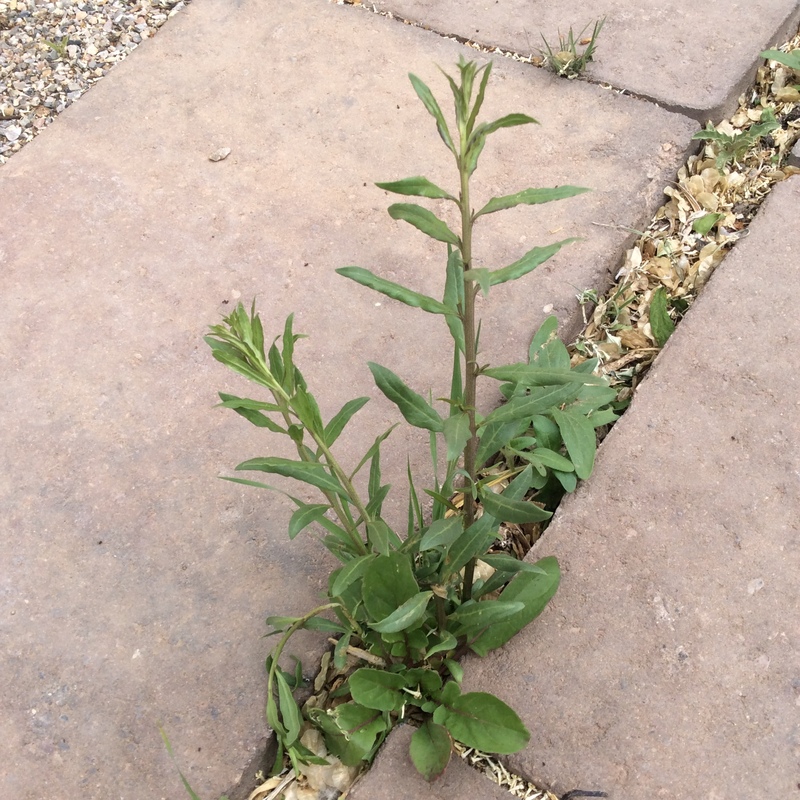 I wouldn’t have guessed that arugula would not only grow well but would naturalize and happily spread itself about. Arugula is my favorite salad green, and I’ve learned to love it for cooking too. Something about its tender nutty sharpness is like watercress gone to heaven. 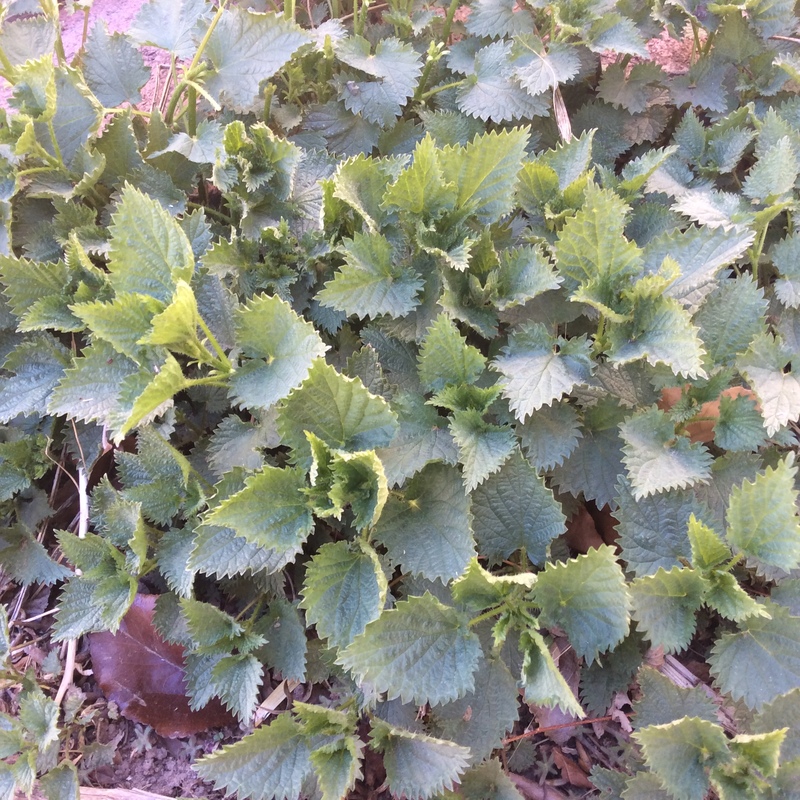 It likes cold weather, and manages with surprisingly little water. First, get your seed. 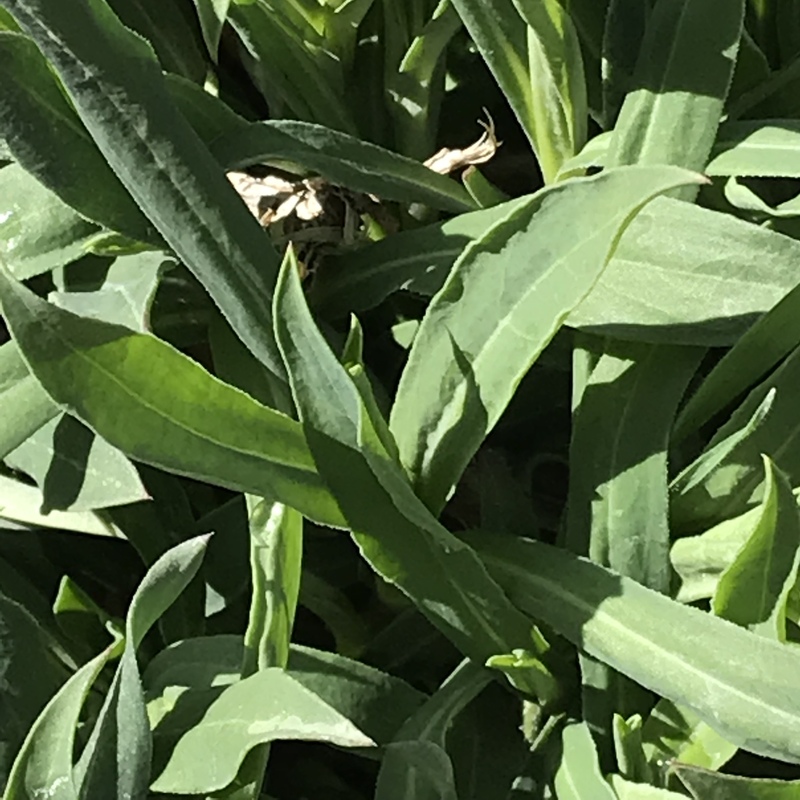 I don’t recommend the wild-type often sold as “sylvetta” because the leaves are small leading to low yield, and in dry conditions it can get too sharp to be pleasant. Try to get the type designated as ‘cultivated” or the named variety Apollo, although the latter lacks the frilly leaves that make such a nice show on the salad plate. In winter or very early spring, scatter the seed in drifts on prepared ground and rake them in lightly, or scatter them in prepared containers and scratch the seed in a little with your fingers. Water occasionally and keep an eye out. Early in the spring, you’ll notice the little plants struggling up bravely. 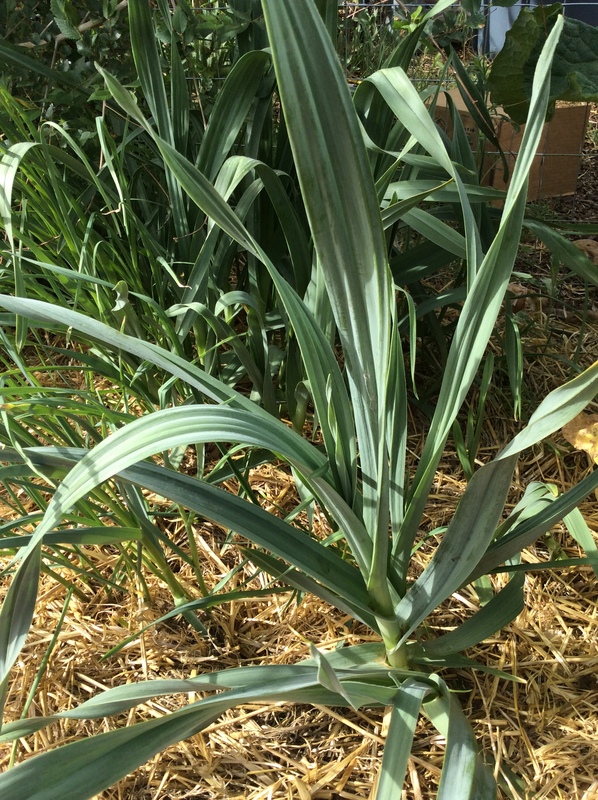 Give them a little water when the soil is dry, and thin them out to stand about 4-6″ apart. Throw the washed thinnings in your salads, of course. 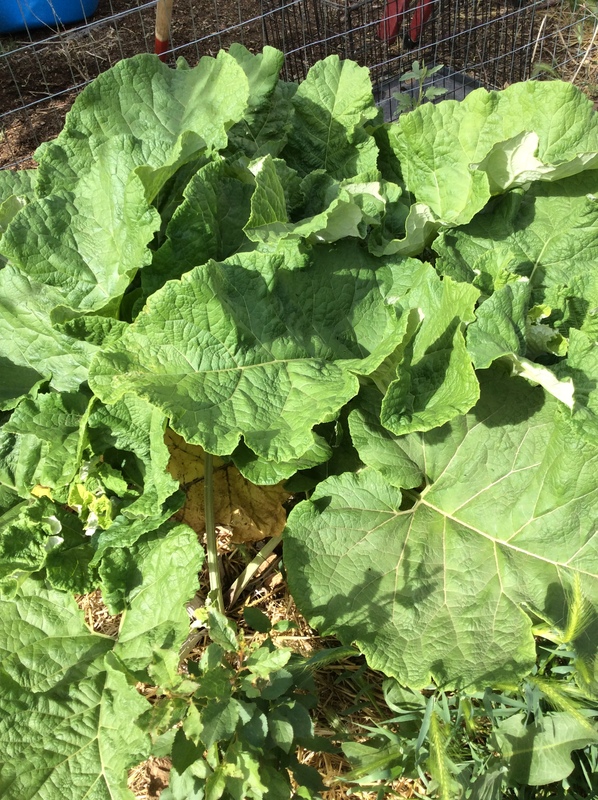 When the plants are about 6″ tall, harvest them heavily for salads, but don’t cut the crown or pull the roots up. Use dressings containing nut oils and good olive oil. Never dress the arugula more than a couple of minutes before eating, because it wilts easily. Eventually the plants will start to bolt to seed. Do nothing to stop them. 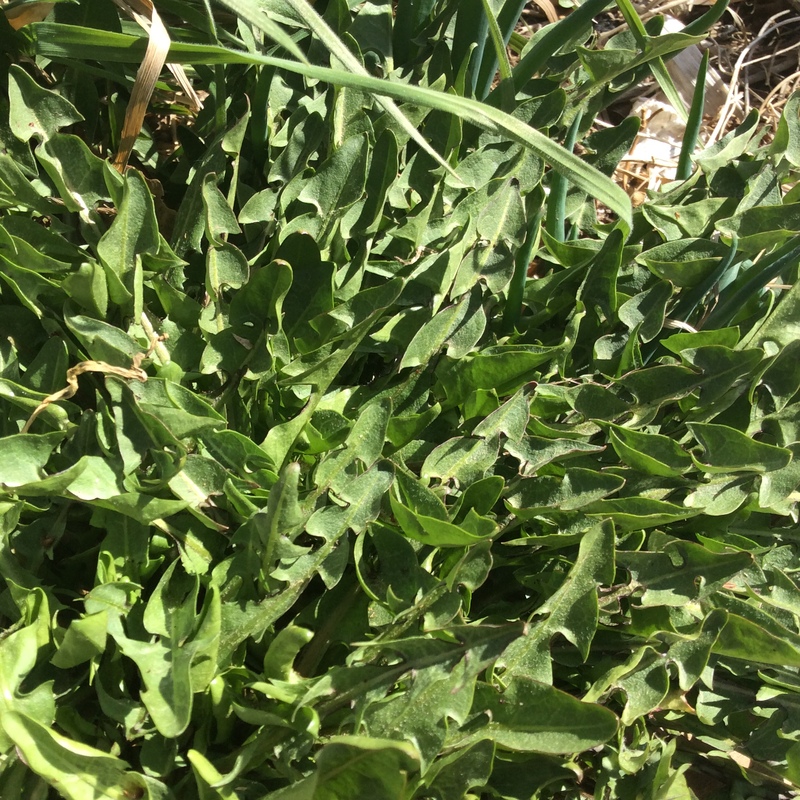 The next phase of the arugula season is starting. Now, what about the plants you left alone? 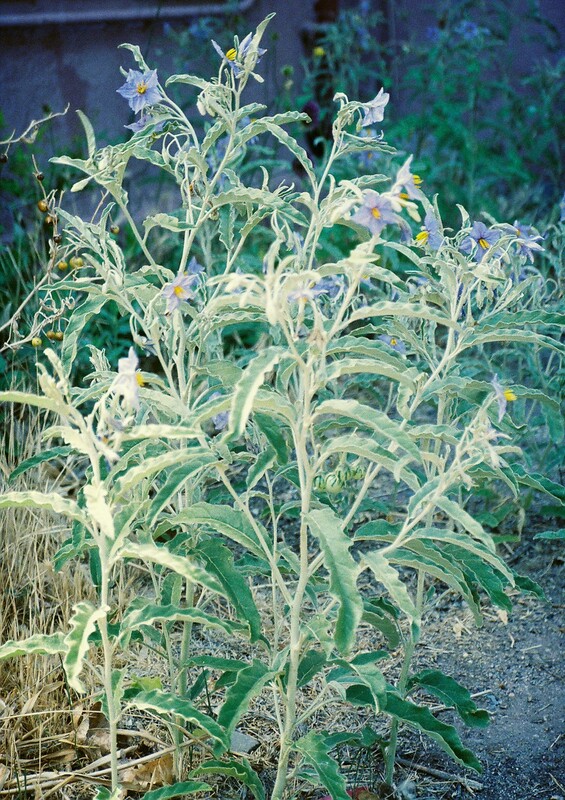 They will develop into great wispy clouds of small white flowers, a little like annual baby’s breath. Bees adore them. Then they’ll set hundreds of tiny seed pods. 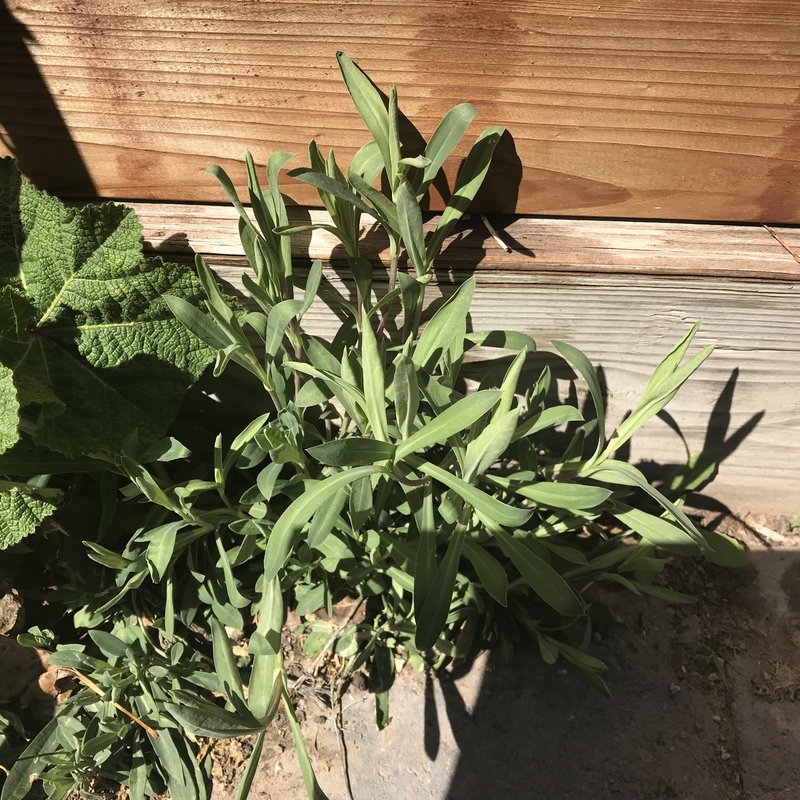 When these dry out, let some spill around the mother plant (which can now be pulled up, and should be, because it looks pretty scruffy by now) and toss the rest around wherever you want more arugula. 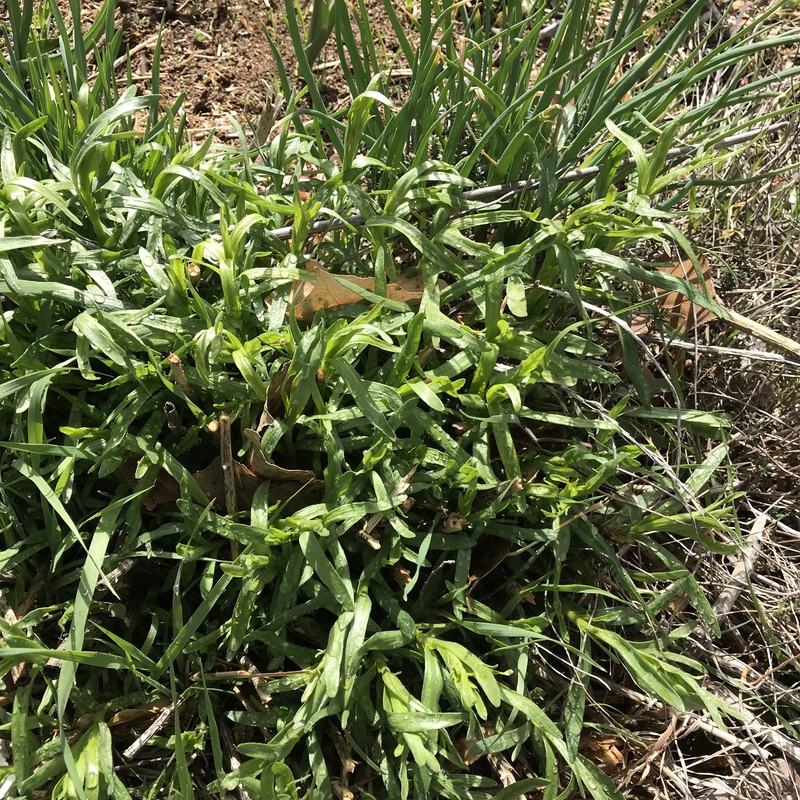 Usually these seeds will be dry and ready for seeding in late summer, will sprout by September, and will be in the salad stage by late October. Leave them over the winter, and the cycle continues.